In a rare battle of contemporaries, Martin Luther King, Jr. takes on Frances Perkins in today’s Lent Madness match-up. Will quirks, quotes, or a combination win the day? To get to this point, MLK had to fend off his namesake, Protestant Reformer Martin Luther, while Frances Perkins felled Hawaiian Damien of Molokai. More questions: Will U.S. Labor Department employees turn out for their former Secretary thereby fueling further controversy? Will Heidi’s going way over the word count impact the outcome? What about all those Mount Holyoke alums jazzed to support one of their own? Or will everyone be walking to Selma by the end of the day? Yesterday Luke sent John Donne to the literary showers and will face the winner of Benedict of Nursia vs. Dorothy Day in the Elate Eight. And in our “To 5,000 and Beyond!” campaign we’re rapidly closing in on 5,000 likes on our Facebook page. In fact we’re at 4,990+ as of this morning. The 5,000th Lent Madness liker will receive the grand prize of dinner with Tim and Scott! (fine print: winner is responsible for travel expenses, luxurious accommodations, and the cost of a fancy dinner). In Lent Madness evangelism news, Tim will be appearing live on Boston Public Radio this afternoon sometime between 1:00 and 2:00 pm to talk about everyone’s favorite Lenten devotion. If you want to tune in to WGBH go here and then click the “Listen Live” button. This could be a disaster. Martin Luther King, Jr., must have been an interesting student. Finishing high school at fifteen, in college he excelled in Bible but struggled with French. At seminary, he made a C in public speaking — twice! He and his wife, Coretta Scott King, spent their 1953 honeymoon at a funeral parlor because they couldn’t stay at at a white-owned hotel. In 1967, he convinced Nichelle Nichols to continue in her role as Lt. Uhura on Star Trek because she was portraying an intelligent crew member who happened to be black rather than a stereotype. “I’m your biggest fan,” he told her. Sounds like Jesus, doesn’t it? Please add your favorite quotes from Martin Luther King, Jr. in the comments! Frances Perkins, Labor Secretary from 1933 to 1945 under Franklin D. Roosevelt, was the first woman to serve in a presidential cabinet. As Secretary of Labor, she was the prime mover of the New Deal, championing a social safety net to the elderly, minimum wage, the Civilian Conservation Corps (CCC), unemployment insurance, a shorter work week, and worker safety regulations. It is said that she wrote wrote the Social Security Act in the rectory of St. James’ Episcopal Church in Washington, DC. While many comments in the first round of Lent Madness pointed to the likelihood of Perkins living an opulent, la-de-da life in Washington, Downey points to a position in Philadelphia that Perkins took in the first decade of the last century. She worked on behalf of poor, immigrant young women who were brought to the U.S. to work at what they thought were legitimate jobs but turned out to be prostitution. “Frances’s job,” writes, Downey, “was to find ways to put pimps and drug dealers out of business, to detect, confront, and bring to law enforcement’s attention the establishment’s preying on women: work considered daunting for even the most experienced social workers. By the time she was in her early thirties, Perkins’ advocacy had led her to the New York State Legislature where, in 1913, she successfully campaigned for the 54-hour work week(!). It was around this time, even though women did not yet have the vote, that Frances began to appreciate the finer points of gaining influence in the halls of power controlled almost exclusively by men. Still a young woman, she realized that men respected their mothers and so began, rather than craft her appearance in a way that was attractive to men, to dress and comport herself in a way that would remind men of their mothers. But what about the other lesser known instances of Frances Perkins’ fame? Would there have been The Sound of Music without Frances Perkins? Her advocacy for asylum seekers in the 1930s, through not as successful for German Jews as she would have liked, resulted in helping the Von Trapp family achieve asylum in the U.S. Because until 1940 the Department of Labor controlled the U.S. Immigration Service, Perkins was successful in helping to extend, often permanently, the visitor visas of at least 30,000 German Jews already in the U.S. Sadly, tussles with the Department of State and lack of solidarity among American Jewish leaders (many of whom worried that a great influx of Jews from Europe would heighten anti-Semitism at home) hampered her ability to persuade FDR to increase quotas. Perhaps as many as 1,000 asylum seekers, about 400 of them children in a special program, were eventually brought to the U.S prior to its entering the war. While Frances Perkins’ roots in Maine run deep — the Frances Perkins Center is based in Newcastle, Maine (where I happen to live) — she was little known here until March 2011 when Governor Paul LePage decreed that a federally-funded public work of art, a 36-foot mural depicting moments from Maine’s labor history, was to be removed from the Maine Department of Labor offices in Augusta. Perkins is featured on one of the panels. As anger and lawsuits about the mural’s removal raged throughout Maine, Perkins’ name and stock rose quickly. After spending nearly two years in “an undisclosed location,” the mural was installed in the Maine State Museum in January 2013. Come on up and see it. 150 Comments to "Martin Luther King, Jr. vs. Frances Perkins"
I agree. While I’ve always admired Dr. King, there are others who fought for all of us. You don’t mean Dr. King didn’t fight for all of us, do you? And in thanksgiving for my freedom to eat dinner in an Atlanta restaurant with a friend whose skin happens to be darker than mine, I cast my vote for Dr. King. Amen to that!!!! Laurie Atwater….Francis Perkins didn’t have the fame of MLK, but she was every bit as important in her fight for the working man and woman of every color and faith. This was an impossible choice, but without any disrespect to Martin Luther King and all he accomplished for the poor of this nation, it seems that Frances Perkins was the first and possibly the only person to show us that as a moral nation we have a responsibility to help the poor, the elderly, the sick and the downtrodden of this world. Her work preceeded Dr. King’s, but was equally important and she should be remembered by those who today would dismantle both their accomplishments. No disrespect to MLK, but Amen Sister! We need a moral and theological voice for the nation now, like the Woman Behind the New Deal! I think it will always be difficult not to vote for the martyr. King knew he was risking his life for the cause he was fighting for. I’m sure Perkins did not have that risk. However, her work was as noble as King’s work and I admire her vision, fortitude and compassion to push forward to help human rights through the political system. It’s amazing in that time that she, as a woman, served as Secretary of Labor. What make me sad is why didn’t I learn about her (and many other worthy women) in school? I never knew who she was until Lent Madness. Me, neither, but as soon as I said her name my son, in AP US History this year, said, oh, she was the first woman to hold a Cabinet position. I think the importance of her work mostly gets credited to FDR, but modern history classes have improved a little in noting the accomplishments of women, and of men who are not WASPs. So Perkins’ memory owes a bit to Dr King, I guess! For me, thanks to the SEC for bringing Frances and so many others to my attention. I try every day to live into those words. About health care: Frances Perkins fought long, hard, and ultimately unsuccessfully to include a health care provision very similar to what is now called “Obamacare” in the New Deal. The interesting thing about these two figures is how similar they were in so many respects. King faced overt and covert discrimination every day of his life, endured beatings and imprisonment, and received personal attacks and death threats as he grew in prominence–to say nothing of his assassination. Perkins faced overt sexism from her Cabinet colleagues, a nasty anti-Semitic smear campaign that labeled her a Jew and therefore a communist, and painful allegations that her husband’s mental illnesses resulted from her achievements. It’s not that these attempts to shut them down were comparable (hard to see anything comparable to what King endure)–it’s that these strategies for shutting down change-makers persist today for those who speak up for love and justice. Always have I expect. That and my fear. Frances gets my vote. 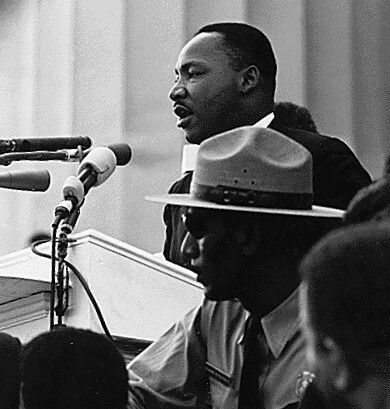 Obviously, MLK, with the help of millions – both black and white – changed world history. But Frances fought her battles outside the limelight, without a press corps and TV cameras at her side, without hundreds of thousand marching with her. While facing horrible discrimination, MLK helped African Americans find and use their voices. Francis Perkins fought for invisible people who had no organization or voices. Both are deserving leaders. For me, Francis’ perseverance reached a broader number of folks – women, men, children – across a huge swath of our nation, no matter the race. She had nothing to gain from waging her war. She did it because it was right. Here, here!!!! It is difficult choice, but I will be voting for Frances for the same rasons. Don’t you mean, “Hear, hear!”? Though I absolutely loved learning about Frances Perkins and the incredible work she did, which so obviously followed Christ’s commandments to care for the poor and vulnerable in society and is something we should especially remember in these times, I must vote for MLK, because I am ALWAYS uplifted just thinking of all he said and did, just as Nash noted: to overcome violence and oppression without resorting to violence and oppression. I said it already when MLK was in the round of 32: I have found nobody closer to a modern-day saint whose example of a life of nonviolence and Christian love should be followed. We still need his teachings in our troubled world today. As they bear the world upon their aching backs. The net of care now stretched to farthest reaches. By threats perhaps more subtle, but not less. With pride, fair work, and food enough to bless. Oh Frances, you sought justice for all ages. Your life we’ll laud, despite despot LePages. Your poem brought me to tears and a laugh. Thank you most sincerely. Dr. King…got to be a King Day today! His good works and martyr status will propel Martin over the top so I cast my vote for Frances to be sure she has a showing worthy of her own contributions. I did not know about her before this Lentmadness. I am glad to have made her acquaintance. @Mainecelt, I like your poem–very clever for so early in the day. I found this quote by and about Frances Perkins – it says a lot about why I will vote for her. But this was a tough choice. It really is too soon for both of these people to be considered for a “golden halo”. However, if I have to choose, the help that Frances Perkins offered the German Jews as WWII began, is one of the deciding factors in her favor. Social Security is the other. Thank you, Frances Perkins! Come on folks! Frances Perkins is a great but, unfortunately, unsung heroine (maybe because she was a woman so FDR got all the credit), who did at least as much for human rights and well being as MLK. MLK has received and continues to receive all the accolades he deserves. He can handle not receiving this one. Now is the time to give the recognition to a great woman! Vote Frances!!! Here here! I cast my second vote for Big Lobster this Lent Madness season and have immensely enjoyed learning so much about her. Where would all us working women be today without her?? Thank you again, Frances! Frances Perkins deserves some recognition as a quiet but influential saint of the church. MLK is definitely notable but I’m voting to advance knowledge of the little sung hero of the workforce. And my fellow Mount Holyoke alum. When evil men plot, good men must plan. when evil men burn and bomb, good men must build and bind. When evil men should ugly words of hatred, good men must commit themselves to the glories of love. When evil would seek to perpetrate and unjust status quo, good men must seek to bring into being a real order of justice. MLK it is- tho the faith required to struggle within the bureaucracy is not to be dismissed lightly! Vt maple for MLK! Thank you, Mainecelt, for your marvelous poem. We need to sing Mother Frances’s praises to the roof tops! Just a little trivia to “lighten the mood”. In which movie was one of the main character’s, whose nickname was “Baby”, named after Frances Perkins? “Nobody puts Baby in a corner”. Gwin has it! I remember being a teenager in the theatre and watching Dirty Dancing. I wasn’t that excited about the movie–just accompanying a friend who had the hots for Patrick Swayze–but when Baby revealed her connection to Frances Perkins and the social justice themes started to emerge, I was riveted! After prayerful debate with myself (never a winning proposition), I changed my vote to Frances Perkins. How many of us learned in civics class that the New Deal was Ms.Perkins’ work, and yet FDR got the credit? As Ms. Ericson states above, now is the time to give recognition to a great woman. I just cannot get past Frances Perkins’ support for Fidel Castro and his chief assassain Che Guevara as their firing squads gunned down those who opposed them. Accepting murder by caling it the price of revolution in my book can never be considered saintly behavior. I have to vote for Dr. King who preached and lived a life of peace knowing full well that evil would one day most likely claim his life. I don’t think Frances Perkins did any of that, though. She was quite a bit before their time…. I am a bit confused by this comment and I wonder if perhaps you are thinking of someone else, Jim. Frances Perkins died in 1965 and I do not recall anything like what you’re describing in her writings. This match-up should only be decided based on accurate information, so it would be helpful if we could either get some context for this comment, or a correction. new believers to find their calling to make a better life for all in our needy world. Both Martin and Frances were headlights leading us to higher levels. I so appreciate Lent Madness introducing me to new beacons in this work of God’s. Match-ups like this one certainly getting me thinking so early in the morning. I haven’t even finished my first cup of coffee and I am pondering on how these two individuals shaped my life. This is not fair!!! Two really great and wonderful people in our own time…..WOW!! Can I vote for both????? Oh the AGONY! Brother Martin got my vote but my heart was tugged hard by Frances Perkins. Difficult not to vote for King. But wow Frances Perkins – you were amazing! I knew nothing of her until I read this. Thank you! I feel inspired. Oh *Wail of Lamentation* why oh why did Frances Perkins have to come up against MLK this early! I have to go with MLK, but I am sad to leave Perkins behind. Maybe Big Lobster will save the day. I knew nothing about Perkins, and I have been so so happy to learn about her. MLK got the Nobel Prize and joined the Presidents and Pulaski (in Illinois) with his own civil holiday. I’m voting for the woman who braved the bureaucracy and was nearly forgotten even in her home! Voted for Frances, while admiring Martin (and the beautiful icon of him at Grace Cathedral). Sometimes it’s the folks out of the limelight, not in the history books, that need some public recognition for their accomplishments. I was a youngster during the Civil Rights era, in college when Dr. King was assassinated; I never heard or read one word about Ms. Perkins. It’s time more people learned about her as well. And thank you, Mainecelt, for your poem. Okay, Verdery, you’ve pushed me over the edge–and what a hard edge! I am so glad to know about Frances Perkins, at last. MLK deserves every bit of acclamation he gets, and I suppose he’ll win this round…but my vote goes to FP today. So many things in common, so hard to choose…. Oh, mercy me . . . how does one choose between two quintessential social activists. They are both so deserving! I would love to cheat and vote for both using different computers but my conscience would not allow that. While MLK, Jr. was a true martyr, there is no question that these two modern-day saints both gave their lives to fighting for the poor, the forgotten and the underdog. True examples of the ministry to which we are all called. Sorry, Martin, but Frances wins my vote by a hair’s breadth. In Africa, I have seen young people reading Ghandi and MLK,Jr and the Bible together. Africa needs this. “We will not be satisfied until justice rolls down like waters and righteousness like a mighty stream” is a great deal more than a powerful symbol in Africa, it is indeed life. And the point is not lost that when the rains come a mighty stream fills the entire stream bed…all of it…for ALL of the people. This is a really tough choice today. I went back to the initial blogs for both and still wasn’t sure. So it’s going to be one of those days when there is no loser. My vote went to Frances, in part because of her powerful, personal response to the Triangle Shirtwaist Factory fire. She was so creative and passionate and tireless in working to solve to the problems she perceived. Dr. King was remarkable and did so much to prevent violence while advancing change. Imagine where we’d be if Frances and Martin had been able to work together. They would have been one heavenly team. Oh, this was a brain and conscience buster!! I voted for MLK solely because he acted under the constant threat of death, otherwise, Perkins would have garnered my vote. Now if I can only get over the anguish of getting lost in yardword the past 2 days and forgetting to vote for my picks, both of whom LOST! just because I didn’t vote… AND I’m apparently NOT the 5,000th person to LIKE you on Facebook (a place I normally avoid like the plague)!!! Ooh, this is a tough one for me! In terms of quotes, Dr. King, with his oratory skills as a member of the clergy and published literary works, wins hands down. Dr. King and Frances Perkins addressed poverty and income inequality, but Perkins’ New Deal legislation was contained to solely Americans and has the advantage as King’s work — the Poor People’s Campaign — was unfulfilled and never reached its fruition due to his untimely death. However, Frances Perkins is definitely a progressive champion for women’s and labor rights and kicked that door open for the inclusion on women in the political arena. Both also addressed racial injustice and discrimination in their life’s work, but I have to give this one to Dr. King, as it was his work fighting against war and U.S. imperialism that gives him the edge for me in this particular face-off. I was all set to vote for MLK, however, I went with Frances. MLK has always been a hero of mine and I knew nothing about Frances Perkins. After reading about Frances, however, I have to go with her – I figure she is the underdog and I will get to vote for MLK later. They are both so worthy of the Golden Crown. Bill O’Reilly’s new book Killing Kennedy is not kind to MLK’s personal life. How much history? How much fiction? Vote to Perkins. I have to comment on your comment Cheribum. Seriously, you read the book by Bill O’Reilly and you based your vote on that? We have here two of the 20th century’s greatest social activists and you wonder whether to take Bill O’Reilly’s word seriously. I can tell you his assessment is probably not the one to base any decision on. Now that IS maddness. My vote, despite everything Perkins did, was for MLK because I believe he in fact lived every day in prayerful consideration of the actions he took. I admire Frances Perkins and believe her life definitely ended in paradise, but I consider MLK a true “saint”. After reading about Frances Perkins’ work with young women brought to the U.S. with promises of legitimate work and then being forced to work as prostitutes, I realized that she was fighting human trafficking long before the term was in wide use. It was another tough choice, but this earned her my vote. I have labored under the misconception that Dr. King was beaten in the first round by Reformer Luther … and rejoice to discover now that I have been wrong. I love Frances Perkins, but Dr. King’s influence, in my life and in the lives of so many others, has to trump all. Interesting psychology of Perkins – “dressing and comporting” herself so that men would be reminded of their mothers. Hmmmn? A good thing and a bad thing, I think. -speaks volumes about men. I trust you have all changed by now, and are well reminded about mothers, wives, sisters, daughters, aunts, ………. -and yep, really difficult choice. Went with MLK because his sacrifice inspired the sacrifice of so many others, and still does today. Arrrgggh! I am tormented by this decision. MLK’s words always inspire and were so critical to a significant, life-altering chapter in this nation’s history, but where might we be had Frances Perkins not done the work she did? And it doesn’t look like she had an easy time of it with the family issues that swirled around her. I do wonder if they ever met. I’ve tried briefly to find something that might tell that story, but cannot locate anything. I must ponder this a bit longer before deciding my vote. I am voting for Francis Perkins. My grandfather was one of the prime movers of reform for the child labor laws in the U.S. in the early Twentieth century. Aspiration certainly is important, it lays the groundwork for moral action. Francis Perkins certainly lived out her Agape by crafting the Social Security Act and the other New Deal initiatives “because it is the right thing to do…..”. The Christ inspired actions of the Saints have very far reaching consequences, which we are still feeling today, and our children and their children will feel in their lives. I voted for MLK, but would really like to have voted for Damien of Molokai. Oh, well. I’ll certainly be listening in to WGBH no matter what…. Ms Perkins is going to be whomped by Dr King, but I voted for her anyway! voting for MLK, but i am most appreciative to have this opportunity to learn more about Frances Perkins. In our one hundred year history, the U.S. Department of Labor has weathered plenty of controversy . . . so we will survive the this one (see second paragraph of Tim’s blog). But in addition to last week being the 100th birthday of the Labor Department, it is also the 80th anniversary of Secretary Perkins’ first day as the first woman to serve in a President’s Cabinet. Whatever the outcome today, the employees of the US Department of Labor are grateful to Lent Madness for educating so many people across the country and around the world about a remarkable Secretary who played a big role in the work, history (and future) of our department . . . and our nation. To learn a little more about Secretary Perkins, and how her faith continues to inspire the work we do today, please read this great Washington Post “On Faith” article that was written by former Labor Secretary Hilda Solis on Labor Day, 2012: (http://www.washingtonpost.com/blogs/guest-voices/post/remembering-the-legacy-of-saint-frances-perkins-this-labor-day/2012/09/01/fdba103e-f462-11e1-adc6-87dfa8eff430_blog.html). Difficult choice. I really did know much about Perkins’ life. She appears to have been an exceptional woman. We do not know what the future holds, but we know who holds the future. For the millions whose shoulders we stand on but whose names, faith, and good works hardly any of us know, I vote for Frances Perkins today. It was a difficult decision…since I spend my days dealing with concientious stupidity. But as others have said…I went with Ms Perkins so she might advance and we would be able to learn more about someone unsung. Dr King has received many accolades here on Earth, and since neither of them will actually benefit from the Golden Halo of Lent Madness…I opted for bowing to the reason for this exercise in stealth education as my guide. Somehow I think today’s candidates would both approve! No contest at all. MLK Jr.’s heroic struggle and martydom trump the political actions (and quite partisan politics at that) of Frances Perkins. Dr. King worked for all, to cure a national problem that had endured for centuries. His impact is rightly remembered on the Mall and on the calendar. Her inclusion is one that I believe truly inappropriate because I do not recall her trumpeting the Gospel as her motivation while Dr. King used it every day in every speech. Pitting a black man against a white woman. How about putting Francis against one of the white men? Francis all the way. Is it necessary to criticize one saint as part of one’s reason to vote for the other? In fact, it reeks of the political campaign we just endured. Both of today’s saints are very worthy. They are not opponents in any sense of the word. We are or should be voting our hearts, not casting stones at one of our saints. Frances Perkins lived and witnessed to the gospel with every fiber of her being throughout her life, not only in public service but in her private life as well. She did so by her actions. Dr. King has rightly been recognized in our society as a prophetic witness to justice and peace in the world. Frances Perkins is an unknown to most folks. She is long overdue some recognition especially when so many in our society where the gap between poor and rich is widening. I don’t think that NASW has yet declared who should be the patron saint of social workers… Jane Addams… Margaret Sanger… Frances Perkins…? Let’s just say that in today’s contest I have to admit total bias. I’m a social worker, a constituent of Big Lobster, and oh, yes I sit beneath the plaque honoring Frances Perkins nearly every Sunday in her home parish, St. Andrew’s Newcastle, Maine. But here’s the rub (and I join everyone here in saying I mean no disrespect to Brother Martin). While I live in a state so White, that many of us still have a long way to go down the anti-racisim road… I also live in a state with an income gap the size of the grand canyon. I live in a state with one of the oldest demographics in country, in THE county that has the largest number of people over age 65 per capita in the entire U.S. I live in a state where many of my near neighbors live in appalachian poverty so deep that it would rival some of the Haitians I know, were it not for the moral vision of Frances Perkins and the safety net she helped create. I live in a state where where some of the only decent jobs that keep young people here are in dangerous professions — like fishing or lumbering — where benefits like Workman’s Comp are not taken for granted. I live in a state where much of the work is seasonal, where families would quite literally starve or freeze without unemployment benefits in the deep winter months. So Brother Martin, I salute you. I am grateful for the ongoing dialogue about race, inequality and freedom that we must continue in our country. But in our own quirky, irreverent, Episcopal way, I rejoice that Lent Madness has brought Frances Perkins’ faith and theology to so many new people. May her witness to the heart of the nation be kindled anew because of this silly game we play in Lent! Yes– I work as a pastor in rural Maine myself. While our church runs a food bank and thrift shop, it’s a drop in the bucket, as the complex issues of poverty here continue to grind away at our communities. On my drive from home to church, I pass many poorly-insulated trailors, dilapidated farmhouses, and even a couple of tar-paper shacks among the woods and snowy fields. I also pass a small lane labelled “hardscrabble road.” Yet imagine these households without Social Security–or the labor laws that govern our workplaces! Thank God for Frances Perkins and her legacy. What a marvelous and lovely tribute to both Frances and Martin. Amen, amen. An earlier post by ? claimed that many of us are more interested in our Social Security checks than in the civil rights of others neglected to note that Frances spent her life working for the civil rights of us all. And, as a senior citizen who does NOT receive social security, I am not speaking as one who cares more about the SS check than the Civil Rights of all! What Ken just said is what I was going to say. Let’s give Frances Perkins her long-deserved recognition for all she did BEFORE WOMEN COULD EVEN VOTE! I sure wish we had her to protect marginalized Americans today! As an aging white Southerner, I am convinced that MLK did more to change my region, my country and my own attitudes than anyone who lived during the last century. And he did it while never wavering from his Gospel message of love (even/especially for his enemies) and non-violence. The only campaign which MLK might be said to have lost is the one he waged in Cicero, a suburb of Chicago. MLK made a profound difference in the North as well. I think some people are responding in madness to a new thing…. I may be discovering that I am too sane to participate in this anymore. The memories of the 60’s…..Oh my…..It was the decade of revolutionry events. Assassinations, Drugs, Rock and Roll, birth control, protests, man on the moon, Vatican II…..Wow, what memories of an incredible 10 years. I can only imagine what DR. King must have faced……But oh, what a legacy he left. I gotta go with MLK, all the way. Interesting logic expressed in the comments here… Perhaps other unexpressed factors are making the race close? As a devoted “Treke” it is very tempting to vote for the man who saved one of my favorite Star Trek characters, however since I am now living (in part) on SS, I must cast my vote for Perkins based on very selfish reasons. With these two wonderful people who changed all our lives in so many known and unknown ways, it is easier to go to the frivolous and self serving for voting reasons. Over 2K votes and a difference of less than forty! Such excitement! Dr. King did many admirable things, but his halo is considerably tarnished; his doctoral dissertation was largely plagiarized, and he was a casual serial adulterer. Both of those things are major issues for me, and so I cast my vote for Ms. Perkins. Such a difficult choice…. why couldn’t both of them get to the final four at least before coming up against one another… King is already a saint in my eyes and in the holy books of many. Frances Perkins remains largely unknown, except to those of us who follow women’s history and a few other historians of new deal politics. So I cast my vote for her. But it was a hard choice for many reasons. Aa an MHCer for life – I must say – Go Frances! It is nice to see that the love can be spread amongst many who fought hard for all of us in different ways and situations. May Lent Madness honor she who overcame many challenges (known and unknown) for us all! It seems that far too many people value their social security check more then their Civil Rights. I guess this is what we ought to expect for an old white church. Still I urge everyone to go read Dr. King’s letter from the Birmingham jail and see if their hearts are not inspired to vote for this saint over a D.C. bureaucrat. I’m voting for that remarkable but unjustly forgotten woman saint, Frances. So glad that Lent Madness told me her story! My college dorm had an MLK lounge with this quote on it. It’s one of my faves. One cannot help but admire both of these people. But King gets lots of attention. 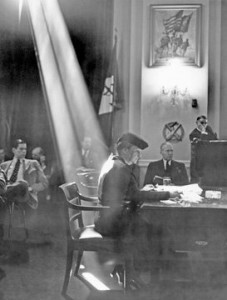 Frances Perkins deserves a moment in the limelight. Her advocacy produced great change from within the system….a notable accomplishment. Let’s let her light shine a bit more with the world. Yes, Heidi blew the word count but Penny invited others to share their favorite MLK Jr quotes thus extending the written influence… well played, Penny. Well played. Tough decision today. Will it be the man who makes my heart soar with hope and love when I read his speaches? Or the woman I knew virtually nothing about, am frankly a bit ashamed to know only what I’ve read of her in the past few weeks, and would love to know more? As usual, Fr. Tim shone brightly! More people the merrier as thats’ll mean more LENT MADNESS afficiandos (sp)….Umm..converts? fanatics?whatevers? My mother taught me about Frances when I was but a wee girl: “she is the women who was in labor the longest!” I guess as the mother of six, that drew great admiration from a devout Republican…..Even if it was a dreadful joke. King its got to be King. we dont have a Perkins Day Holiday. I think we need a Perkins Day Holiday! Thank you, Heidi, for this beautiful essay about Frances. Thank you, also, Carl for posting the article about Hilda Solis visiting Perkins’ church, St. James’. And for the quirky pop culture factor, thank you, Matthew, for reminding us all about Babe in Dirty Dancing being named for Frances! I was going to mention that today, but you beat me too it. This was a hard match-up for me, as I count them both among my heroes, and because of my parents’ work in the Civil Rights movement. And no matter which one goes up against my parents’ friend Jon Daniels, that will be another dilemma! Both Frances and Martin advanced the cause of the marginalized and poor–and created real change. Both were rooted in faith. For today, for the sake of elevating someone who is not as well-known or celebrated, but should be, I went with Frances. Also, she’s an Episcopalian. Though not a deciding factor for me, that makes me smile. I have an intuition, which could be wrong, that the work of Frances Perkins would have been done if she had not done it. That is mostly because I think it was Roosevelt who cleared the way for her and for service. I think of MLK, however, as one of those extraordinary instruments of God’s grace that is so daring and so breakthrough that our culture almost cannot absorb it. I come from slave-owning ancestors and I grew up near Detroit; a student in my class in junior high was nearly murdered in a racially motivated fight. We used to talk about this stuff in my house. I remember one of the only times I saw my father break down was when MLK was assassinated. MLK inspired people way beyond our own country and continues to leave a legacy for generations to come of sainthood, both in what he did and how he did it. While Perkins was a great contributor, I believe the spirit of Lent Madness is to elevate those who mostly closely imitate Christ. So MLK gets my vote!! We take so much for granted, but we shouldn’t. Quote from Dr. King (shaking his hand was one of the great moments of my life): Love your enemies that you may be children of your father which is in heaven. WE must love our enemies, because only by loving them can we know God and experience the beauty of his holiness. Of course, this is not practical. Life is a matter of getting even, of hitting back, of dog eat dog. Am I saying that Jesus commands us to love those who hurt and oppress us? Do I sound like most preachers – idealistic and impractical? My friends, we have followed the so-called practical way for too long a time now, and it has led inexorably to deeper confusion and chaos. For the salvation of our nation and the salvation of humankind, we must follow another way. On this day when Francis I is the new pope (white smoke, not purple), how could I not vote for Frances P? Even if the name is spelled differently? Dr. King went beyond stretching the status quo; he helped to restore fundamental human dignity to a large part of our world, not sure how much that differs from what Frances Perkins did, but in my heart his work and ministry called to me more. It is funny (disconcerting and sometimes heartbreaking) how we are still working so hard to live the Sermon on the Mount 2000 years later. MLK gets my vote. Not saying that Francis is not worthy. I see in MLK the drive for a fairer and more equitable world, where colour, race or creed do not divide us. Where Love is the answer and still continues to be today. How many death threats did Ms. Perkins get? How many times was Ms. Perkins beaten, attacked by police dogs, or jailed for acting in the name of justice? What assassin took her from us? I don’t believe a martyr should win this game simply because he or she is a martyr. And I admire the work Ms. Perkins did in a male-dominated world. But a person who perserveres in speaking truth when he or she knows doing so may cost them their life deserves to elevated to a status above the rest of us. Folks — her first name is FrancEs, not FrancIs (the new pope). I came to check on how the vote was going, and I am astounded that the Rev. Martin Luther King, Jr. is behind in votes. I voted for Frances Perkins in the last round. She’s wonderful — but as wonderful as she is, I believe Brother Martin is the one. Unsolved question–maybe for Maple Anglican: is the new Francis name honoring Assisi? Francis Xavier? I read that it was for Francis Xavier, not St. Francis of Assisi. Francis Xavier was co-founder of, and one of the first 7 Jesuits. But maybe it’s for both of them — I’m hoping the Assisi Francis was part of it. Assisi, according to the Vatican, because of his vow of poverty. It’s amazing to me that this is the first time a Pope has chosen Francis for his name! But it’s really, really wonderful. It feels like a big change, and I’m hoping it portends great things…. Hmmmm, any cosmic coincidence in the election of the new pope(Francis) & Frances being in the lead (at this point, anyway) today? What a tough choice! Both did so much for ALL of us! All I can say is that I have learned more about Francis Perkins this round than ever before! What an amazing person! She has my vote. Thank you, Fr. Tim and Fr. Scott and noble CBs for introducing the Lent Madness crowd to saints old and new—-as in new to us in the crowd! LM is truly an AWEsome program. The new(to me)-kid-on-the-block, Frances Perkins, gets my vote today. Does anyone else in LM imagine these modern saints high fiving each other as the votes roll in? My favorite Dr. King quote, “Nothing in the world is more dangerous than sincere ignorance and consciencious stupidity”. This was a very difficult selection and both have my vote for their contributions, but I will have to go with MLK. I have a scar courtesy of a billy bat in Selma. Never met Father John, but did walk with Dr. King. He gets my vote. Wow. I’m surprised at the current tally! Two people whose lives made a huge difference in our society, both positive. Almost hadda do a blind vote! Another Mainiac for Perkins (for all of the reasons previously mentioned)! I’m amazed that Frances Perkins won out. I voted for her but thought she had no chance of winning. The “LentMadness” continues! In the words of FP: Be ye steadfast! Wow!! These are getting tougher. But, ultimately, I cast my vote for MLK, Jr. because I believe that “darkness cannot drive out darkness; only light can do that. Hate cannot drive out hate; only love can do that.” One day, I hope that more people will become familiar with the influence Bayard Rustin had on King. Rustin, a Quaker for whom nonviolence was a lifestyle, I think captures MLK, Jr.’s courage and conviction when Rustin said, “To be afraid is to behave as if the truth were not true.” Both men serve as an inspiration for those of us still engaged in the fight for justices for all. As a Social Security employee I just had to go with the author of the act that created my job. Go Frances. It is tough though with MLK as the other choice. 90 mins to go and looks like an upset. I’d never have predicted this outcome, not in a million years. Puts the madness in Lent Madness. Well done to all! Wow! That was a nail-biter! I so love Lent Madness!